The genus Euonymus contains dozens of plants, including shrubs that are either deciduous types or broadleaf evergreens, with leaves rather than needles. Euonymus shrubs have many garden uses, but they're vigorous growers and a bit of pruning is sometimes in order, either to improve a plant's shape, to remove damaged branches or to help keep its size under control. Burning bush sometimes keeps its leaves in winter. It's best to prune a euonymus shrub either at the end of winter or in early spring, when it's poised to put out new growth. For a deciduous plant, this timing also lets you to see the "skeleton" of the shrub, making it easier to decide what to remove. Some euonymus shrubs are spring-bloomers -- these include the European spindletree (Euonymus europaeus), which grows in U.S Department of Agriculture plant hardiness zones 4 through 7. To enjoy their flowers, delay pruning these plants until just after they bloom -- this allows enough time for new buds to form before winter arrives. 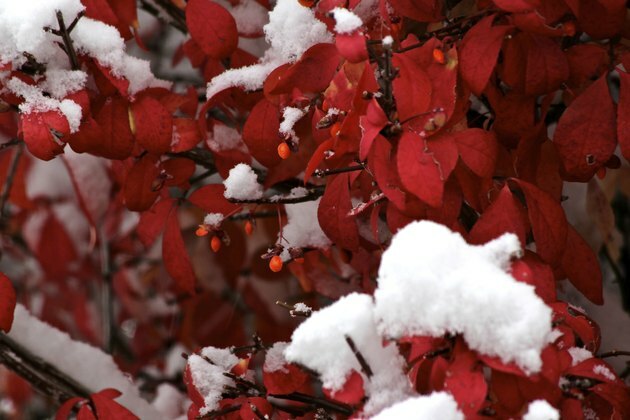 Don't prune a euonymus in late summer or fall, because new growth may be damaged by winter's cold. Most euonymus shrubs have a naturally pleasing shape, but sometimes a mature plant might look a bit leggy, with some open space between branches, a problem that can be corrected by pruning. Pinching back growing tips of young shoots stimulates new growth at the outer limits of a shrub, increasing its overall bushiness. Deciduous shrubs respond well to shearing with a hedge trimmer, held parallel to the plant's surface while cutting back outer branches. Avoid shearing an evergreen euonymus -- it's best to thin it by removing several branches at their origins, helping preserve a more natural look and avoiding the appearance of cut foliage at its surface. 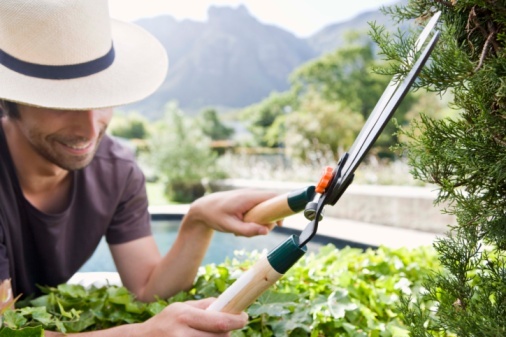 To prevent spread of plant diseases, disinfect your cutting blades by wiping them with rubbing alcohol between cuts. If a euonymus shrub has outgrown its space, you can prune it to bring it back within bounds. Head back main branches by about one-third to one-half on all sides of the plant, cutting at a spot just ahead of a bud or a smaller, lateral branch -- choose buds or lateral branches that point in the direction you want to see new growth. Make your cuts on a slant, cutting about 1/4 inch ahead of a bud or lateral branch. It's also a good idea to cut branches at slightly different lengths around the plant to keep its shape looking natural as it puts out new growth. Pruning also helps maintain a healthy shrub. Examine the plant at the end of winter and remove any branches damaged or broken by storms, and monitor it for any other damage during the growing season, removing branches as needed. Euonymus shrubs are are usually disease- and pest-free, but some types, including the European spindletree, can develop mildew or other fungal problems, causing leaves and twigs to blacken and die. Prune these branches back, cutting into healthy tissue just behind the affected area. Fungal problems are best prevented by planting a euonymus in an area with good air circulation, using a soaker hose to avoid wetting foliage and clearing away debris from under the plant regularly.